...its the same as Musicbox3 but with a bow transom. Musicbox2 looks a lot like a shallow draft Micro and that's what she's supposed to be. 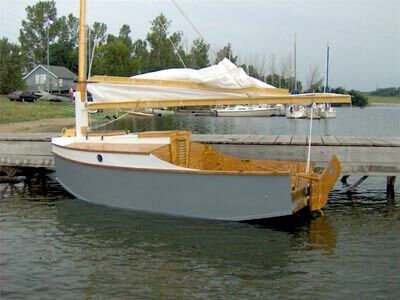 I helped build a Micro a few years back and have spent several hours sailing one in both light and heavy winds. Micro certainly sails well, especially considering she will easily host six adults. I thought Micro had two shortcomings. Her keel can be a challenge to build and makes launching and beaching difficult. And her tall rig can be an effort to put up. Perhaps both features contribute to her good sailing, but she's not something you'd want to trailer to a lake for a short Impulse sail. Musicbox2 is about the same hull size and I believe her to be even roomier. Ballast is a thick bottom and steel bars bolted to the bulkheads Inside - simple and cheap. Lately I've been able to do more extensive capsize studies having found the free "Hullform" program on the Internet. It shows Muslcbox2 to be 'self righting" up to about 70 degrees. Not sure what that means although to most of us that would be a fearsome angle, in the old days Chapelle. sad that if a sharpie could right from a 45 degree heel, It was "self righting'. But I see today's blue water keel boat sailors worry If they can't self right quickly from rolling 150 degrees, i.e. almost Inverted! Also I've used my favorite pivoting leeboard and rudder with a gaff rig, stepped off center on a tabernacle for easy boarding and rigging. There's a boarding ladder built Into the bow. A mizzen could be added straight away, but for impulse sailing this single sail rig Is better. Musicbox2 takes five sheets of 1/2" plywood, six sheets of 3/8" plywood, and five sheets of 1/4* plywood, with simple glue and nail construction.